Place almond flour, baking powder, baking soda, xanthan gum, salt, xylitol and cold butter into a food processor and pulse just until it resembles breadcrumbs. Do not over process! Turn into a mixing bowl and add the egg, sour cream, lemon zest, and blueberries and mix just enough to form a rough, soft dough. Be gentle so you don’t smash the blueberries. Turn onto a board (use almond flour to dust if sticky) and knead about 5 times until the dough is all together. Be very gentle. The dough will be very shaggy. Flatten the dough lightly with your hand until it is a 1 1/2 inch thick. Use a round 2 1/2 inch metal cutter to cut into thick circles. 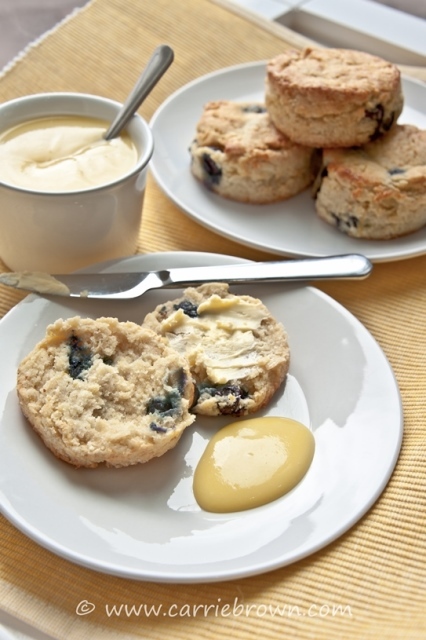 Very gently push the dough out of the cutter and place scones on a baking sheet. Experiment with this recipe to make it more SANE. Test out the recipe by swapping out the sour cream for greek yogurt or coconut cream, and by reducing the volume of butter and supplementing it with solid coconut oil. These are great served with a SANE Lemon Curd (as pictured) or a dollop of greek yogurt on the side.